President Donald Trump has signed a directive that authorizes NASA to return American astronauts to the Moon—a mission that would lay the foundation for a possible mission to Mars. The renewed emphasis on space exploration, said Trump, is to ensure America’s primacy in space, to protect its citizens, and to create jobs. But while a coherent and ambitious space program is welcome news, the announcement can also be seen as a distraction. With astronauts Christine Coke, Peggy Whitson, and Jack Schmidt in attendance, Trump made “Space Policy Directive 1” official. The decision to return to the Moon and lay the groundwork for a mission to Mars was based on recommendations made by the National Space Council National, which made its findings known this past October. “This marks an important step in returning American astronauts to the Moon for long term exploration,” said Trump, adding that the mission will do more than just leave “a flag and footprints on the Moon,” hinting at a possible base and potential mining activities. “We’re about to begin new journeys of exploration and discovery... and once again imagine possibilities awaiting in those big, beautiful stars, and dare to dream big,” said Trump. In addition to “reclaiming our proud destiny in space,” Trump said the new directive will spur innovation—including the development of technologies that can be leveraged for military applications. The mission to the Moon, it’s clear, is more than just about restoring American pride—it’s also about making sure the US continues to be a part of the 21st century space race. During the brief signing ceremony, both Trump and Pence were thin on the details. It’s not immediately clear what this means for NASA in terms of budgetary allocations, or when the space agency might expect to see such funds. No timelines were given for a return to the Moon or a pending mission to Mars. For Trump, this is all low hanging fruit and an easy win. His administration has, rightly, faced accusations of being anti-science. But the decision to return to the Moon shouldn’t be construed as a sudden change of face. As both Trump and Pence admitted, this is about creating jobs, restoring America’s presence in space, and developing its space-based military capacities. At the same time, the announcement distracts from (arguably) more pressing scientific issues, such as climate change, the shift to renewable energy, and environmental pollution. 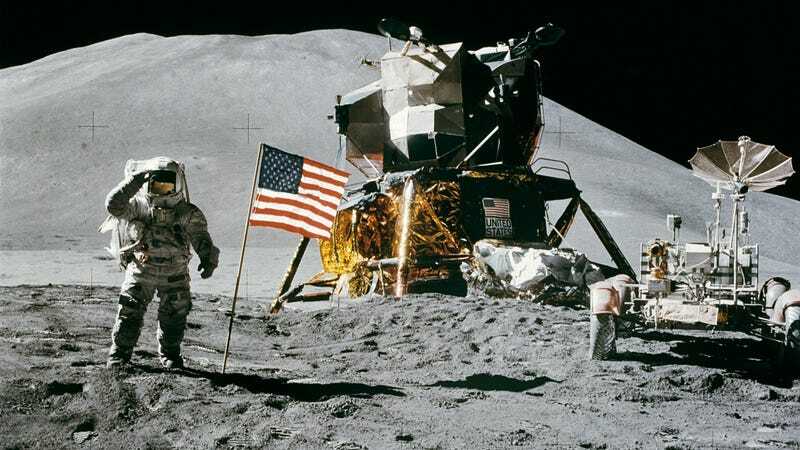 For the moment, let’s celebrate the decision to send Americans back to the Moon—but not at the expense of ignoring the many problems that still exist back home in the US.